We are faced with umpteen choices every day, from small moments to big time. We are faced with dualistic ways. It's inevitable to move forward, to go ahead from one minute to the next and from one decade to another. Right from the time we are in the utero, we subconsciously take a decision to remain in vertex (head down position) or some fetuses are in a breech (bottom down or military position) and such subconscious decisions are taken by us as a biological unit naturally, where we do not have choices. As a human being, we continue doing many things naturally, subconsciously and also as a teenager, we choose many paths subconsciously. Next minute, we may put down our phone and watch news on TV or pay a bill or recharge. Next month, we may book a tour to Andaman or Bali. Next semester, we may drop computers and pursue IT. We take decisions and make choices from childhood and sometimes look back and regret. Many engineering students regret their decision to pursue engineering. Many medical students curse the day they came to medical school. Most advocates are envious of judges and all judges envy lawyers. How many hours to study, 6 or 16? Which movie to watch, romcom or action? Which college to take admission in? Which course to pursue? What interests us is not in our hands. But, we making decisions is. What we need to do is: make informed confirmed choices and adhere to our decisions and enjoy the best for prosperity n posterity. 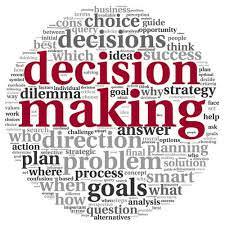 Before understanding how to make good decisions for ourselves, it’s critical to realize the fact that we must make decisions, big or small, every day. And there’s no escaping it. Wise are those who realize early on in their lives that their lives are a result of the decisions they take. And hence, it’s critical to realize the power we have in our hands and make informed choices every day, which have the potential to shape our futures and destiny. After all, life is what we make it to be, with the choices that are put in front of us.